Faith, welcome to Homeschool Authors. Tell us a little bit about yourself. Thank you letting me join you! I am a 23 year old homeschool graduate. I love playing piano, singing, crafting, and spending time with my family. I live with my family on a small hobby farm in Wisconsin. I also enjoy serving my church. This year my sister and I are directing the Christmas play. And obviously, I love reading and writing. Have you always loved hymns? Yes, I have. I love the beauty of the hymns in both the music and the words. There is simply nothing better than listening to or singing a hymn. Who are some of your favorite music artists? I don’t honestly remember. I think I just started coming up with some story ideas and wrote them down. Mom encouraged me to write by giving me school assignments. As I approached high school, I knew that I really liked writing and Mom tailored many of my school assignments to accommodate my passion for writing. What inspired A Mighty Fortress? Four or five years ago, Vision Forum had a writing contest based on the picture on their magazine. I was too old to enter the contest, but I wrote a story about the picture anyway. It also ended up being too long for the contest since it was about 25,000 words when I finished the rough draft. The story also changed from the picture in subsequent drafts. The picture was of a brother and sister dangling from a rope off a cliff with a cougar staring at them and the sister is aiming a small pistol at the cougar. The cougar changed to a timber wolf and the pistol changed to a rifle. Can Joshua lean on God's strength to keep himself and his sister alive until they find a town? Will Jed be able to face his anger or will it consume him completely? All three are running--the hunter and hunted. What will happen when they meet? Who will enjoy A Mighty Fortress? Anyone who likes Westerns, Christian Historical Fiction, or adventure. I aimed my book mostly for teens and young adults, but parents and other adults would also enjoy A Mighty Fortress. 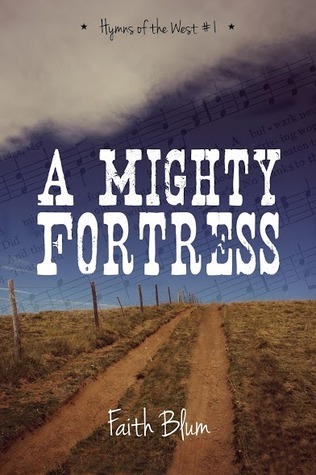 If you would like to read an inspiring, adventurous Christian Western you can find it on Amazon on Kindle or Paperback. I would also like to thank Sarah for hosting me today. It has been fun answering these questions. Faith is giving away one e-copy of her book! Enter to win below. Looks like a neat book! I see that it's the first in the series! When do you plan on writing/publishing the rest? Hi Faith, I so enjoyed reading this interview! My question is: Who was your favorite character to work with while you were writing this book? Thank you, Anna! Yes, it is part of a series. There will be at least three more books. I am currently working on book two, "Be Thou My Vision". I hope to publish it by the end of this year, but that may not happen. We shall see what the year brings. Who was my favorite character to work with? Honestly, it was Jed, the villain. Yes, he was hard to write, but he was also fun to write because he is so totally different from any other character that I have written. Rachel, I do, too. Which is why I chose to write the genre. :D So far my plans are to do "Be Thou My Vision", "Come Thou Fount", "The Solid Rock", and possibly "Amazing Grace". As for when they will come out, I'm not sure. I am HOPING to do approximately one book per year, but that depends on what else happens in my life. God is in control of that, not me. How many more books do you have planned for this series?